Learn about the general preparation requirements for sending inventory to Amazon fulfillment centers, as well as the specific product categories that require specialized prep. Before sending products to fulfillment centers, it's important to know what is suitable for the Fulfillment by Amazon (FBA) process and what is not. For more information, visit FBA product restrictions and Shipping and routing requirements. Note: Inventory that arrives at a fulfillment center without proper preparation or labeling may incur a preparation fee. Note: A unit that falls under multiple categories must be prepped according to all applicable prep types. For example, if you are selling bottles of shampoo and conditioner as a set, both units must meet the prep requirements for liquid products and be labeled with a "Sold as set" sticker so they are not separated. Follow these general requirements when shipping units to Amazon fulfillment centers. Certain products have other specific requirements. Amazon may refuse, return, or repackage any product delivered to a fulfillment center with inadequate or non-compliant packaging at your expense. Any FNSKU you use on a unit must be unique and must correspond to one unique product. For example, each assortment type, such as size or color, must have a different FNSKU. Each unit must have an exterior scannable barcode or label (which includes a scannable barcode and the corresponding human-readable numbers) that is easily accessible. For more information, see FBA product barcode requirements. 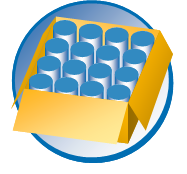 Remove, cover, or render unscannable any existing scannable barcodes on the outside of shipping boxes. For example, cover existing barcodes with opaque tape or use a black felt-tip marker to render the barcode unscannable. This prevents the incorrect barcode from being accidentally scanned during the receiving process. 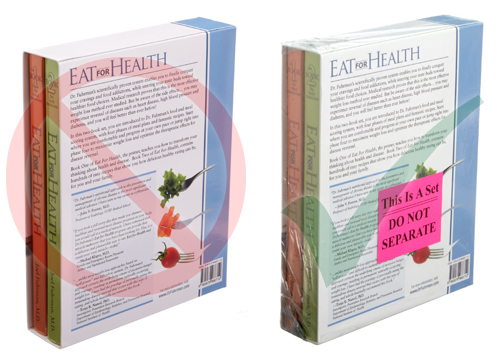 Each unit, including multiple-volume book sets, must be contained within a single, secure package. Amazon does not accept units that would require Amazon to assemble multiple pieces (for example, wheelbarrows where the handles and legs are separate, but are sold as one piece). 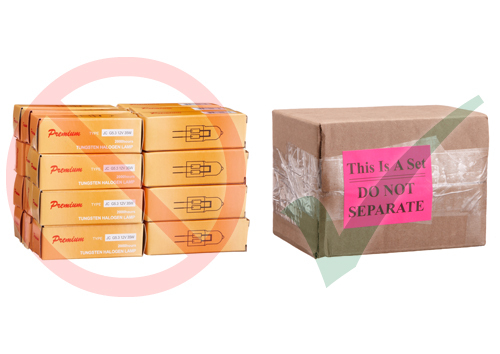 Units that are not contained in secure packaging, like loose sleeves or pouches, must be bagged or secured with a non-adhesive band or removable tape. Footwear, regardless of material, must be packaged with no shoe material exposed, either in shoe boxes or in poly bags with a suffocation warning. Watch this brief video for examples of how to prep your products for shipment to and storage in Amazon fulfillment centers. Units that are sets (for example, a NASCAR set of six unique Hot Wheels cars, sold as one unit) must be marked as sets on their packaging. Add a label to the unit that clearly states that the products are to be received and sold as a single unit. For example, "Sold as set," "Ready to ship," or "This is a set. Do not separate." Not permitted: Separate units within a set. Permitted: Units clearly labeled as a set and sealed so they cannot be separated. Must have openings or a lid that will not easily open on its own. If the box can easily open on its own, use tape, glue, or staples to keep it closed. Must not collapse when medium pressure is applied to any of the sides. If the boxed unit has perforated sides or openings, the product must pass a 3-foot drop test, consisting of one drop on each side, and one drop on a corner. If the product does not pass the drop test, it must be placed in a poly bag with a suffocation warning. Poly bags with a 5-inch opening or larger (measured when flat) must have a suffocation warning, either printed on the bag or attached as a label. Failure to apply a suffocation warning may lead to the items being re-bagged. Warning: To avoid danger of suffocation, keep this plastic bag away from babies and children. Do not use this bag in cribs, beds, carriages, or playpens. This bag is not a toy. The thickness of the bag must be at least 1.5 mil (thousandth of an inch). The poly bag must have a barcode (UPC, EAN, etc.) or X00-label that is scannable through the bag or have an X00- or ASIN label on the outside of the bag. Poly bags must be completely sealed. Note: Highly scented products (such as candles, incense, or bully sticks for dogs) must be sealed or bagged to prevent the absorption of the scent into other products. All products in a box must have matching SKU and condition and must have been packaged together by the manufacturer. All boxes with the same product must contain equal quantities of that product in each box. For example, a case pack of 24 units must always contain 24 units. The case pack limit is 150 units per case. While receiving this type of shipment, the fulfillment center scans one unit from the box and the box is placed in inventory. There is no need to scan every unit because they are all the same. In some cases, a manufacturer or distributor may package more than one case pack into a larger box called a master carton. Master cartons do not qualify as a case pack and must be split at the appropriate case pack level. Note: For case-packed items, you must remove or cover any scannable barcode from the case. Only the units within the case can have scannable barcodes. Individual items: Each box may contain one or more products of varying quantities and conditions. Case-packed products: All products in a box must have matching SKU and condition. All boxes with the same product must contain equal quantities of that product in each box and must have been packed by the manufacturer. Products that expire must include the expiration date on the master carton in 36-point or larger font and on the individual units. Lot numbers alone are insufficient. Expiration dates must be displayed in the format MM-DD-YYYY or MM-YYYY. If the expiration date is printed in a different format, a sticker with the correct format must be applied, covering the original expiration date. For more information about requirements for products with expiration dates, see Expiration-dated FBA inventory. Amazon will not accept marketing materials such as pre-priced labels, pamphlets, price tags, or other non-Amazon labels. Use safety knives with covered blades when packing products. This helps prevent sharp objects, such as blades, from being accidentally left in boxes and potentially injuring an Amazon associate or Amazon customer.